Born in poverty. Cared for the poor in the hospital in Medina del Campo, Spain. Carmelite lay brother in 1563 at age 21, though he lived more strictly than the Rule required. Studied at Salamanca, Spain. Carmelite priest, ordained in 1567 at age 25. Persuaded by Saint Teresa of Avila to begin the Discalced or barefoot reform within the Carmelite Order, he took the name John of the Cross. Master of novices. Spiritual director and confessor at Saint Teresa's convent. His reforms did not set well with some of his brothers, and he was ordered to return to Medina del Campo. He refused, and was imprisoned at Toledo, Spain, escaping after nine months. Vicar-general of Andalusia, Spain. His reforms revitalized the Order. Great contemplative and spiritual writer. Proclaimed a Doctor of the Church by Pope Pius XI on 24 August 1926. As a child, János attended schools run by Cistercians until the schools were nationalized by the post-World War II communist government. He felt drawn to the Cistercians, and entered as a novice in Zirc, Hungary in 1950, taking the name Brother Anasztáz. But a few months later the communists began suppressing religious orders and houses, and Brother Anastasius had to continue his vocation from private residences, and then from the seminary where he studied for the priesthood; he continued his Cistercian training via correspondence. 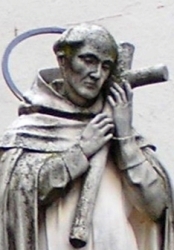 Cistercian friar. Ordained a priest in the diocese of Szombathely, Hungary in 1955. Noted for his youth mininstry, which drew the ire of the atheist government. His bishop offered to move him somewhere safer and out of the limelight, but Father János declined. On the night of 14 December 1957, Father Brenner received a request to give last rites to a sick person; it was a lie, meant to draw him out where he could be ambushed and murdered. Martyr. Daughter of Johann Heinrich Schervier, a wealthy needle-factory owner and vice-mayor of Aachen, Germany, and Maria Louise Migeon; god-daughter of Emperor Francis I of Austria. She ran her father's household at age 16 after the death of her mother and two older sisters to tuberculosis, and had a reputation for generosity to the poor. In 1844 she became a Secular Franciscan, and in 1845 she and four companions established a religious community devoted to caring for the poor. This group, Sisters of the Poor of Saint Francis, was approved by their bishop on 2 July 1851. Their first community in the United States was founded 1858, and Mother Frances visited in 1863 to help her sisters nurse wounded Civil War soldiers. She visited the United States again in 1868, encouraging Philip Hoever in his establishment of the Brothers of the Poor of Saint Francis, and overseeing the foundation of several hospitals. Mother Frances was cured of asthma in 1870 by making a pilgrimage to the healing waters of Lourdes. At her death, there were 2,500 members of her community worldwide, and the numbers continue to grow as they operate hospitals and homes for the aged. Born to a pagan family, Venantius converted to Christianity when still quite young. He grew up in Aquileia, Italy, and studied grammar, rhetoric, and law at Ravenna, Italy. While a student he became nearly blind, but recovered his sight by anointing his eyes with oil from a lamp that burned before the altar of Saint Martin of Tours. In gratitude to Saint Martin, he made a pilgrimage to Tours via the area of modern Germany, making the journey from about 565 to 567. In Tours he became a close friend of the bishop. Lived in the Loire Valley for while, then settled near Poitiers, France. During his travels he often paid for his supper by reciting poetry, singing, or making up rhymes on the spot. From 567 to 587 he counseled a local community of nuns on matters spiritual and financial. Priest. Advisor and secretary of Queen Saint Radegunde, wife of King Clotaire I. Bishop of Poitiers c.600. 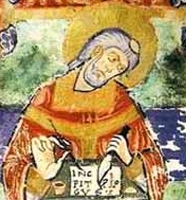 A wanderer up to then, when Venantius became a bishop he became a model of temperance and stability, and was known for his love of food and friends and joy. He wrote hymns, essays, funeral elegies, homilies, and metrical lives of the saints including Saint Martin of Tours (which runs to 2,243 hexameter lines), Saint Hilary of Poitiers, Saint Germanus of Paris, Saint Albinus of Angers, Saint Paternus of Avranches, Saint Marcellus of Paris, and Saint Radegunde. His poetry and songs often concerned daily life and work and people and politics, and have become a valuable resource for historians of the era. He is considered the last of the Gallic Latin poets, and one of the first Christian poets to write works devoted to Mary. Educated by the monks of San Antonio Aban. Lebanese Maronite monk in Batrun, Lebanon in 1828, taking the name Father Nimatullah. Worked as a bookbinder of religious works for his house. Ordained in 1833. Spiritual director and novice master in his house, and chosen to be part of the General Council of the Maronite Order. Spiritual teacher of Saint Charbel Mahklouf. Know for the zeal of his faith, his devotion to Christ and Mary, and his deep prayer life. Brother of Saint Eutropia. Bishop of Rheims, France, and founder of its basilica. Martyred in the barbarian invasion of Rheims, an invasion he saw in a vision. Stone mason. Franciscan. Priest. 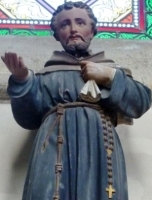 Pastor of Saint Gregoire, Rennes, France, where he attended to his duties barefooted. Had a special ministry to the sick and the poor. Disciple of the Apostles. Bishop of Bergamo, Italy. Hermit near Naples, Italy. Abbot of San Gaudioso monastery at Abtini, Italy. Reported to be a miraculous protector of Naples during the Saracen invasions, turning aside invaders by showing the cross. Experienced a conversion experience after hearing Saint Philip Benizi preach in Pistoia, Italy. Joined the Servites and worked as a peace-maker between the warring factions and city-states of Italy. Member of the Hospitallers of Saint John of God. Martyred in the Spanish Civil War. Mercedarian monk at the monastery of Saint Thomas the Apostle in Tortosa, Spain. Noted for his zealous faith and observance of the Rule of his Order, and his deep prayer life. Benedictine Cistercian lay-brother at Sangra menia abbey, Spain. Received his nickname due to his life-long bread-and-water fast. Sister of Saint Nicasius. Martyred in the barbarian invasion of Rheims, France. She attacked her brother's murderer, and was immediately killed. Bishop in the area of Thérouanne, northern France for 39 years. Deacon. Martyred in the barbarian invasion of Rheims, France. Lector. Martyred in the barbarian invasion of Rheims, France. Bishop of Pavia, Italy. Some records indicate his martyrdom, others not. A group of Egyptian Christians martyred together in the persecutions of Decius - Arsenius, Dioscurus, Heron and Isidore. Martyred in the persecutions of Decius. The only surviving details are three names - Callinicus, Leucio and Tirso. Several pilgrims from Egypt to Cilicia (in modern Turkey) who planned to minister to fellow Christians suffering in the persecutions of emperor Maximinus. They were arrested, torture, mutilated and then imprisoned in Ashkelon. Some were ordered to forced labour in the mines, but we have the names of three who were martyred by order of governor Firmilian - Ares, Elijah and Promo. Several Christians, including a brother and sister, who were martyred together by pagans. The only other information to survive are the names of the two siblings - Fingar and Phiala. Three Christians who were martyred together. Known to Saint John Chrysostom who preached on their feast day, and left us the only details we have - their names - Drusus, Theodore and Zosimus.